One of my friend recently discovered that after he installed Windows 7 on his HCL laptop he wasn’t able to adjust the laptop screen brightness using the Fn key. Unfortunately, the HCL site didn’t have any Windows 7 drivers for his laptop. Moreover, installing the right display drivers didn’t fix the job. I tried to fix the problem but wasn’t able to do so. While searching over the web, I came across a software known as DimScreen that adjusts the laptop screen brightness without using Fn key. You can also this software on any desktop computer as well. It is portable freeware and is only 207KB in size. You don’t need to install it, just double click to run it. On the first run you’ll discover that your screen brightness suddenly went low. Don’t get scared. You can toggle the settings. 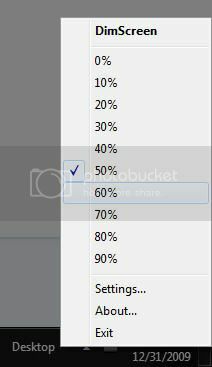 To change the brightness, you can right click on the tray icon and select the percentage of brightness. 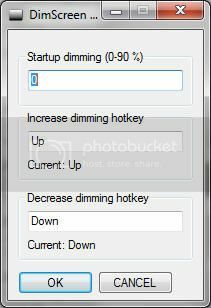 You can also configure a hotkey by going to settings to easily increase or decrease the brightness.